When University of Notre Dame graduate student Chris Dant takes a picture, he expects to come away with more than just a photograph. The third-year MFA student wants you to relate to and learn more about whatever you’re looking at. Be it an old Naval armory, or a group of skateboarders in South Bend. 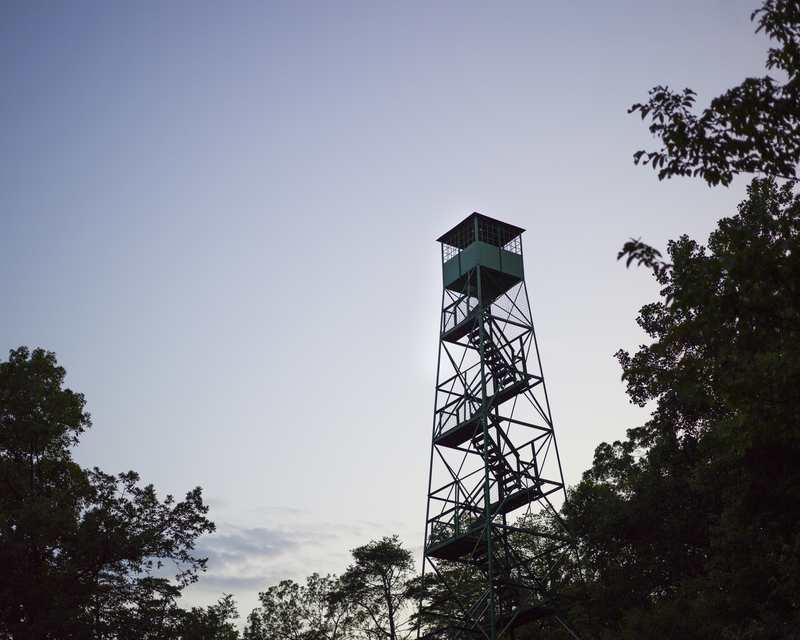 Dant’s ability to find those connections earned him a recent commission from the South Bend Museum of Art to document Works Progress Administration (WPA) projects across the state. His project, titled “WPA in Indiana,” was featured at the museum throughout December and January and commemorates Indiana’s bicentennial in 2016. “Chris was the ideal person,” said Richard Gray, associate professor of photography and chair of the Department of Art, Art History, and Design, who recommended Dant to the museum because of his unique style. “He has a strong documentary approach in his work, and that’s what the project called for,” Gray said. 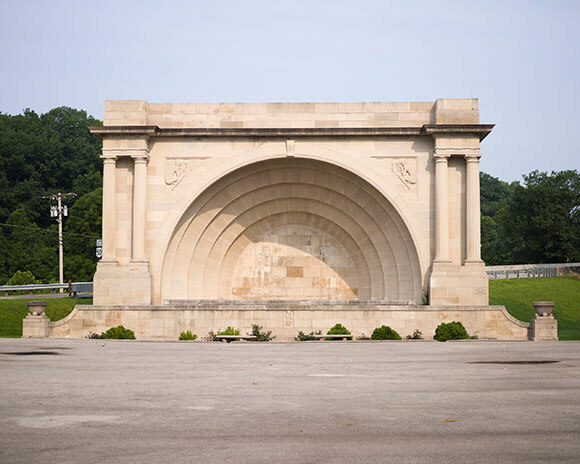 Made of limestone, the Otis Park Bandshell in Bedford, Indiana, was completed in 1938. While more and more contemporary photographers are using digital equipment, Dant prefers to shoot on film, and he doesn’t manipulate his images with post-production tools such as Photoshop. “It makes for a better process for me,” he said. For the bicentennial project, Dant conducted extensive research on the history of the WPA—the federal agency that funded $13.4 billion in public works projects from 1935 to 1943—then spent weekends traveling to the remaining project sites throughout Indiana. He photographed a variety of locations, including outdoor band shells, a Naval armory, athletic fieldhouses, and bridges. The project, Gray said, required Dant to do much more than just make a trip, snap a few pictures, and move on to the next site. He needed to find a way to convey the depth, history, and story of each location. “He has the perfect artistic perspective for the type of project that this was,” Gray said. Dant worked on the WPA project for several months, collecting about 45 images, then collaborating with the museum to select the 11 photographs that were ultimately showcased. 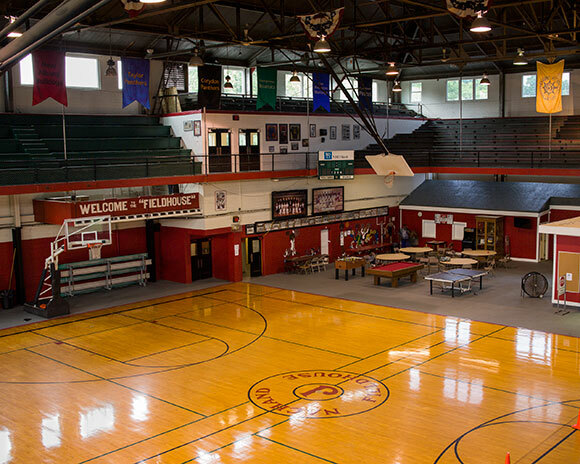 Nachand Fieldhouse in Jeffersonville, Indiana, built in 1937. Dant, who completed his bachelor’s degree at the University of North Texas, said he felt compelled to pursue further study in photography. A professor there recommended Notre Dame’s graduate program, saying he believed Dant’s personal process and technique—from his use of film to the way he looks at images through the viewfinder—would develop and flourish here. For the past year, Dant has been at work on his master’s thesis, which chronicles a group of skateboarders in South Bend, capturing the emotion that dominates their journey through adolescence. Some of the teens come from families with absent fathers, and one way they deal with that loss—and try to find themselves—is through their skating. “They’re really kind of on their own, in this transitional phase between being a boy and being a man,” he said. Once he finishes his thesis and coursework, Dant hopes to apply the skills he’s developed at Notre Dame to produce his own projects and to help aspiring photographers, possibly as a teacher. Originally published by Tom Lange at al.nd.edu on January 25, 2016.